Diabetes mellitus is a metabolic disease in which the body does not produce or properly use insulin that is produces. This leads to high levels of glucose in the blood, which can cause damage to many organs, nerves, and blood vessels. The number of individuals with diabetes in Canada is projected that diabetic population will jump from 3.5 million people in 2015 to 5 million by the year 2025 ( Diabetic Canada, 2019). Foot and ankle complications of diabetes are influenced by many factors including periperhal neuropathy, peripheral vascular disease , infection and minor trauma. Peripheral neuropathy and peripheral vascular disease are the two most common underlying complications of diabetes mellitus and the primary causative factors for foot ulcerations and amputations in diabetic patients. Diabetic foot ulcerations are a frequent complication of diabetes and are a leading cause of hospitalization in people with diabetes mellitus. The primary goal to managing the diabetic foot and complications with foot ulcers is to avoid lower extremity amputations by providing prompt and effective treatment of the foot, prevention or further problems, as well as patient education. Reduce shock: When we walking 1 1/2 times your weight goes into every step you take. So if you weigh 250 pounds, up to 375 pounds of force are being placed on each foot while you walk. If the foot is excessively pronating or supinating, you are putting an enormous amount of strain and force on certain parts of the foot and lower limb that they aren’t designed to handle. Reduce shear and horizontal movement within the shoe: During motion, if the foot is sliding around in the shoe excessively without any support from the arch or areas in or around the shoe, that could lead to blistering and possibly the development of ulcers. Supporting both fixed and flexible foot deformities: Often times what causes the feet to function improperly is the way they are structured. Forefoot varus deformities are quite common in people with excessive amount of pronation and flat feet (pes planus). If you view the foot in a non weight bearing position from the frontal plane ( either from the back or the front of the foot) a forefoot varus deformity is when the forefoot is in an inverted position as opposed to being level in relation with the rear foot. So when the foot makes contact with the ground, when weight is transferred from the rear foot to the forefoot to toe off, the foot is forced to roll inward excessively (pronate) so that the big toe can touch the ground for propulsion. Conversely, a forefoot valgus deformity is when the forefoot is in a everted position with the rear foot, which cause the foot the roll to the outside (supinate) which is lead to ankle instability. Properly fitted custom orthotics essentially fill in the gap caused by the deformity and aligning the foot so that it functions normally. Limit motion of unstable joints: Excessive joint mobility can often lead to any number of conditions of the foot. The two main areas are the subtalar joint joint (located at the rear foot in-between the heel bone (calcaneus) and talus bone) and the 1st metatarsalphalangeal joint (big toe joint) Any increase of motion in either of those two joints can lead to a number of problems. Unstable subtalar joint can either cause the the foot the pronate excessively or supinate excessively leading to lateral ankle instability. Unstable 1st metatarsalphalangeal joint can lead to poor push off of the big toe during propulsion and can impact the foot biomechanics. Many diabetic foot ulcers and complications in diabetic patients are preventable and treble with patient education, properly designed and fitted custom- made orthotics, and finally proper footwear. 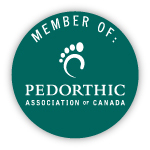 Custom Orthotics are frequently prescribed for patients with diabetic neuropathy to return the foot back to its correct alignment and thereby offloading high pressures from the metatarsal heads and the heel, which reduces the risk of plantar foot ulcerations (Pedorthic Association of Canada). Properly designed orthotics are effective in reducing ulceration rate and peak pressure in people with diabetes and peripheral neuropathy. For patients with partial foot or toe amputations, custom-made foot orthotics can be used to assist in movement with a prothesis implanted in the orthotic. One of the most common areas of amputations in the diabetic foot is the big toe. Since that is the area where the foot has to propel itself forward, there is a great amount of force that has to be associated with that. When the toe is removed, that is an integral part of the foot that is need for the foot to function adequately. A toe amputation can lead to a further problems resulting in uncompensated gait changes ( changing the way you walk to compensate for the absence of the toe), increased subtalar joint foot pronation, as well as other lower limb conditions that can occur if the foot is not functional normally. To modify this problem, an extension of the orthotic can be used to act as a prosthetic toe that will force the foot to toe off and thereby improve the functionality of the foot and the way it is used for propulsion. The custom made orthotic not only supports the foot and maintains its neutral position and proper alignment it also acts as a prosthetic to guide the foot to function normally. This can also be translated to patients with amputation of the supporting toes of the foot. Prosthetic extensions of the foot can be applied to the custom orthotic to help stabilize the foot and improve its function. It is important to remember that the feet are the foundation for the entire body. The body is not unlike any other mechanical structure in that when the foundation is not sound, or supported properly, that will negatively impact the rest of the structure and the way it will function. By properly supporting and evenly distributing pressure the feet will have a sound and stable foundation, thus resulting in improved function of the lower limb.